The Illustration Work of Louise Byng as seen from Earth. 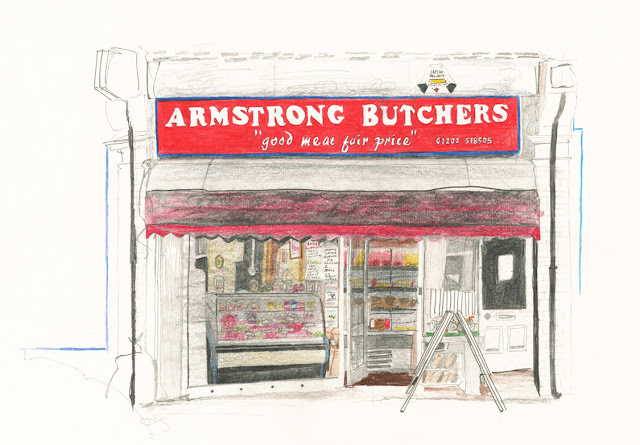 : Armstrong Butchers. When I noticed the tag line of this local butchers I simply had to draw it. In the same way as Norman's Launderette, I am happy to see this shop still in existence amongst convenience-driven stores. It will not be open 24hrs like some supermarkets, but who needs to buy food around the clock; plan ahead! You can also buy just as much local meat as you need at a justified price without being encouraged to overbuy due to offer after offer after offer, which inevitably leads to wasted food. Traditional businesses just speak to me about how life now could be better; with more personality, higher quality goods and less human laziness. God bless you, Armstrong Butchers.